Need to study up for your next fishing trip or tournament? Thanks to Navionics, you can view all of the most popular fishing destinations in detail for FREE! It functions just like a typical GPS unit that is loaded with Navionics charts. Click and drag the map to find the lake you are looking for. Use the + and – to zoom in and out for the lake that you would like to view contours for. You can also toggle the overlay data so that it includes satellite imagery or terrain overlay on the map. Offering over 500 maps of lakes, reservoirs and rivers throughout the U.S. and the Province of Ontario, Canada, Fishing Hot Spots has earned a reputation for providing its customers with quality products and outstanding service. All Fishing Hot Spots maps give you an accurate, detailed lake map loaded with information to help you get on fish quickly. Depth contours, structure, boat landings, marinas, flooded timber and weedbeds are just some of the features commonly shown. Whether you’re after panfish, bass, trout or pike, Fishing Hot Spots maps have all the detail needed to eliminate unproductive water and head straight for the action. Fishing Hot Spots products are available at thousands of independent bait & tackle shops, marinas, and sporting goods dealers. They’re also found in leading sporting goods departments at major retailers across the nation. If you can’t find what you’re looking for, you can order online or directly from Fishing Hot Spots by calling 1-800-ALL-MAPS. Whether you fish man-made reservoirs or natural lakes, the maps from Fishing Hot Spots will help you catch more fish by eliminating unproductive water. More than 17,000 total lake maps with complete fishing information for your GPS, plus over 1,000 high-definition lake maps featuring 3D View, Panoramic Lake Photos, Top-down Satellite Imagery, and exclusive 1′ contours from Navionics own on-the-water surveys. 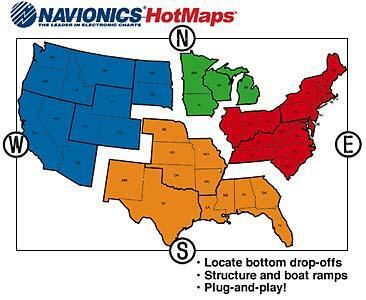 Choose from 5 huge NEW regions throughout the US and Canada on a media card compatible with your chartplotter. CF and MicroSD media cards are pre-programmed and ready to use with today’s leading chartplotters… just plug-and-play! TurboView™ Compatible with select chartplotters. NOS Data Explorer offers access to many products, including bathymetry, coastal maps, environmental sensitivity index maps, aerial photographs, and more. The NOS Data Explorer serves as a portal to obtain NOS spatial data. The NOS MapFinder service provides “one stop shopping” for images and data from a number of National Ocean Service (NOS) offices. 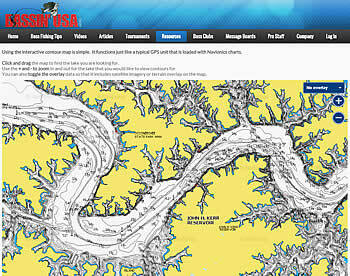 The cornerstone of NOS MapFinder is a robust set of products available directly from the Web. These products are offered by theme (e.g., coastal aerial photography, low resolution nautical charts, coastal survey maps, environmental sensitivity index atlases, hydrographic survey outlines, historical maps, water level station data, geodetic control points, and estuarine bathymetry data). Products are accessed through a spatial inventory that locates and describes all data that NOS possesses for each theme. This allows for greater flexibility to identify specific products at regional, state, and local scales. Finally, accompanying each theme are explanatory information and metadata intended to help users better understand specific products, their sources, methods, quality, and usefulness. Maptech’s digital mapping business encompasses navigation software; digital, nautical and aeronautical charts; and topographical maps. It also produces paper marine chart and guide products. In the United States, Maptech is the largest private publisher and distributor of paper and electronic raster nautical charts. Maptech began producing raster USGS topographical maps in 1996. Today, it is the fastest growing segment of Maptech’s business. Recently, raster aeronautical charts were added to Maptech’s product base. Maptech offers several marine and land navigation software products that operate with its raster maps and charts. These navigation software products range from simple map and chart viewers to sophisticated marine navigation software systems. Maptech has licensed its technology to over one hundred “Value-Added Developers” (VADs) of navigation software systems, which utilize electronic charts and maps. These VADs are actively competing to develop and market products that take advantage of the newest computing technology and the most recent innovations using the Global Positioning System (GPS). From www.mapquest.com, consumers can find millions of locations anywhere in the world, obtain detailed maps and accurate driving directions, locate places of interest, customize road trip plans, and create, save, fax, download or email personalized maps. MapQuest’s Yellow and White pages allow people to find contact information for residents and businesses in any city together with maps and directions to get them there.